About meRetired academic living in Johannesburg. Book enthusiast for life. tastes eclectic. Trail the second hand bookshops wherever I happen to be. museums, art, cities, photography). My library comprises nearly 14 000 books, and have now been catalogued. 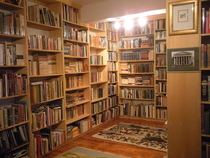 All the books in my library are actual books owned by me and can be touched, opened, read and enjoyed as treasures . Books open doors to other people's souls and ideas and take one back through time . I have catalogued in order to know what I own . 5 stars - a superb book , recommended to the highest degree and had influenced me in an important way.